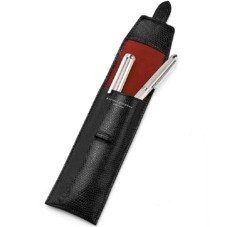 Store and safeguard your prized Aspinal of London pens with our Leather Pen Cases. Exquisitely handmade by master craftsmen from the finest Italian calf leather, they are perfectly sized to hold up to two pens, secured with a fold-over tab closure. A myriad of shades, from traditional jet black to bold raspberry and contemporary silver, allows you to express your unique style, while the decadent suede lining protects your pen from scratches. A must for avid writers and discerning professionals.